You just came back from a convention with a stack of business cards and are looking through them. Every card is different, but they all contain similar elements, we hope. 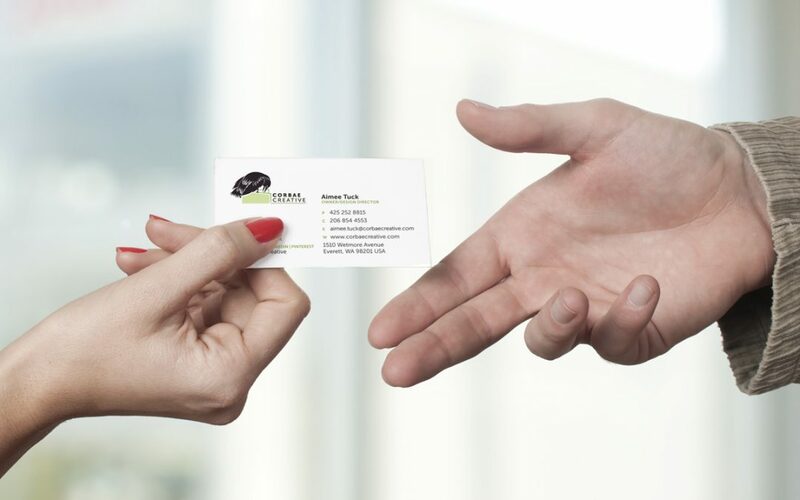 The basic function of a business card is presenting an easy way for people to take your contact information along with them to access it later. But, the basic business card has evolved to so much more than that. And in Japan, there has evolved an intricate etiquette in the handling of business cards called Meishi. Handled appropriately, a person may make a good impression by following the proscribed structure of handing out and receiving business cards. With that said, what kind of information should you include on a business card? Well, it depends on how you would like the recipient to reach you. At the very least, your name and some form of contact method – phone, email, twitter name are necessary to fulfill the basic function of a business card. Additionally, your business name, your title, and other forms of contact are helpful. Adding your business address will give your business extra solidity with a physical “place”. Some are no longer including an address since for many types of business it no longer matters where a person is located. And that tech writer you just spoke to who works for a company in Reno, Nevada actually works out of their home office in Dallas, Texas. Which address should they use on their card? There has been a lot of discussion about using PO Box addresses on a card as well. On the one hand, for a freelancer working out of their home, a PO Box may be a solid option for business mail delivery and keep their home out of the public eye so to speak. On the other hand, a PO Box does not denote a physical presence, but a temporary location that can be changed. Before using a PO Box, know your audience and have a reasonably solid understanding of their comfort level with something that looks temporary. Generally, the older your audience, the less comfortable they will be with a temporary-feeling location. You may be better off not including an address at all. Beyond the basics, make a determination how connected you’d like to be. Do you have a cell and a land line? Include both? Or, do you regularly forward one line to the other as you are in and out of your office, so it would be simpler to include just one number. One number to remember. Do you “reserve” your cell phone to trusted colleagues? Do you still have a land line? Even if you have multiple email addresses, include just one on your business card. It is much more straightforward. You don’t want to make your audience guess which email would be the best one to contact you via. Whether or not you include Twitter handles, LinkedIn and Facebook names, Google+ identity, Pinterest profile name, etc., comes back to knowing your audience. If your target audience is primarily on Twitter, then it would make quite a bit of sense to include it. If most of your audience thinks Twitter is a sound a bird makes, ask if it’s worth the space on the card. Alternatively, if it’s included on your card, it needs to be a social media outlet you monitor. Do you have a Facebook account, but maybe log into it once a month? It may not be the best use of card space to include it. We have a client who’s primary customer base is over 65. To ensure their business cards are easier to read for older eyes, we chose to split up the information between the front and the back of the card and use a larger point typeface – a 10pt type. That is at least a couple of points larger than the standard 6-8pt type found on most cards. But it was important that their target audience be able to read the card handed to them. Larger text used for easier reading by older eyes. More of a standard point size used on this card. Ultimately, what to include should be considered depending on your audience and what is important to you and your company, always keeping in mind that readability is key. You may include 20 ways to contact you via social media, but if it is in four point type, scrunched together, a reader will more than likely toss the card because they can’t read the thing.